Capturing the detailed actions of privileged users is even more critical in today’s business environment. Security and compliance issues also exist with third-parties including Cloud Providers, Service Providers and ISVs. And every major compliance regulation requires organizations to document what users actually do with the privileges and rights granted to them and how their actions impact the IT environment. 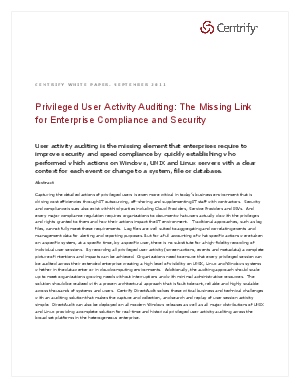 This research paper covers how to solve the security, compliance, and third party access challenges organizations face when auditing and monitoring UNIX, Linux and Windows systems; and why traditional approaches like log rollup tools alone will fail to meet requirements of today’s demanding IT environment.